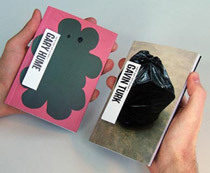 Pocket-sized books on living artists, published by Royal Jelly Factory. The New Art Up-Close series offers a fresh take on traditional art books. Presenting the work of international, living artists in a highly accessible format, each book serves as an informative introduction to the featured artist's work. Priced at £4.99, each book includes 32 full-colour pages of artworks spanning the artist's career, an exclusive interview with the artist, background notes on every illustrated work, a biography, and suggested further reading. The books - designed by Graphic Thought Facility - feature unusual, folded-tab covers and have won acclaim as design objects in their own right. A cute and affordable series of art books, produced with love and care. An innovative and eloquent primer on artists whose work you may wish to explore further ... ideal for artists or students seeking inspiration. Certainly a series to look out for.